Last edited by Ray Rogers; 10-11-2018 at 08:41 AM. 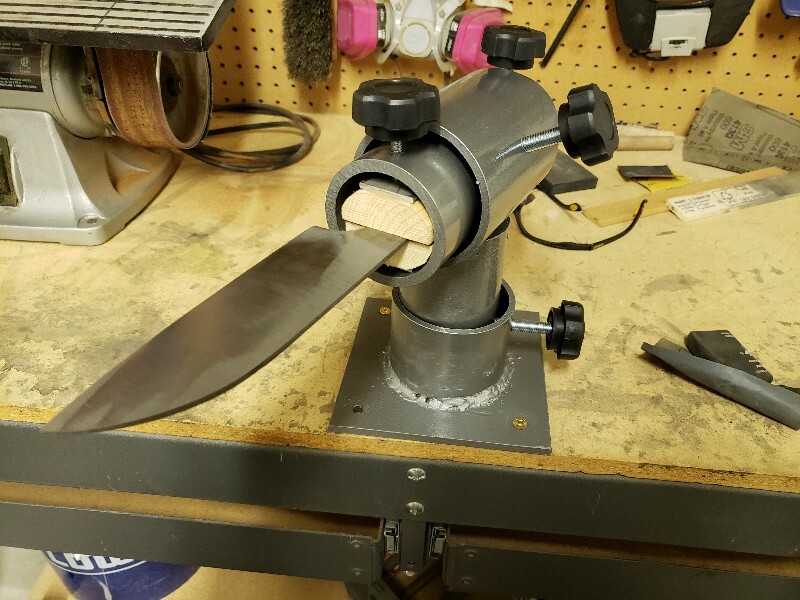 You really don't want to have the end of the knife hanging out over the edge of the work bench like that. It would be too easy to walk or fall into the point of the blade. Other than that it's a real nice vice. That looks really ggood I have one like that but its square and I did NOT make it :-) but that will serve yyou well I would sugest to either move it back on the bench or make sure you take it out EVERY time you walk away as doug suggested that is a accident waiting to happen what happens if you stumble and the knife goes right through your face! but again very nice work! Nice. Great advice above on safety as well. I see you made it so it will swivel at the base, so if you can make it a habit, practice swiveling the blade back over the bench when you stop - for any reason. 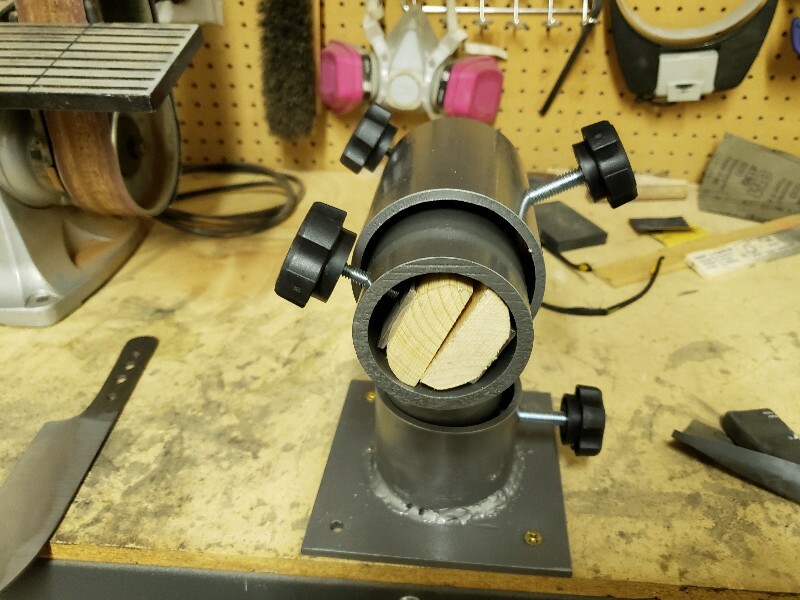 I made mine to clamp in my swivel vise or any other of my bigger vises. Finally got in the habit of removing and setting aside if I plan to leave the immediate area (took a few near misses as mentioned above to get the message). Experience is a good teacher, but not always the most fun. Might could paint it bright yellow or orange for a visual reminder - grey is kind of "camo" in a knife shop. I did pad my jaws with sole leather for a little more secure grip. Doesn't mare the blade and can be changed out without reshaping the wood when needed. Like the big knobs on yours, seen too many homemades that require a wrench or allen to tighten or release. Those tools like to sneak off and hide under things. 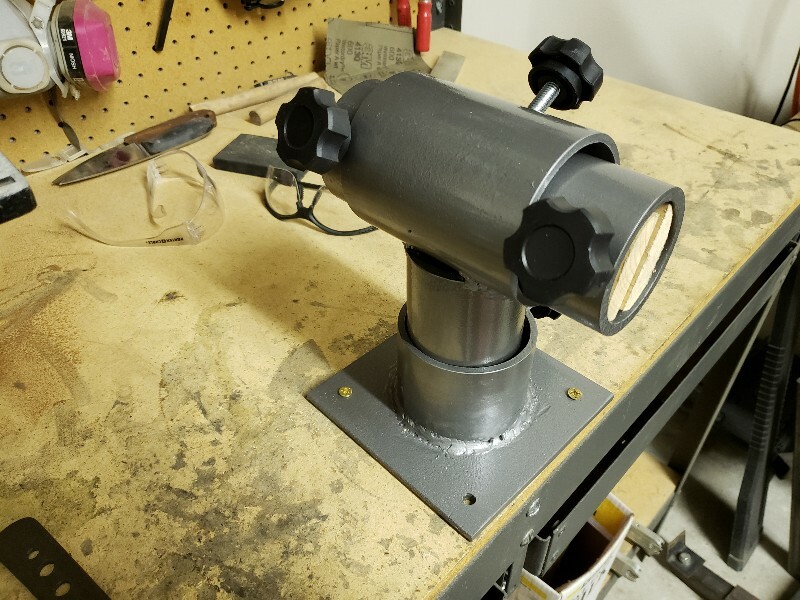 Very nice work on that vise, good job! Thanks everyone for the advice. Makes sense. I'll. I've it farther in on the bench.